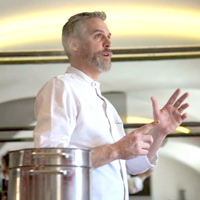 Being a personal chef, I have had the pleasure of working both for the rich and famous, and I consider it essential for anyone visiting Rome to participate in the unique experience I offer, whether it be a dynamic cooking lesson or a sublime four course dining experience. The menu is tailored to your requirements. Becoming a qualified chef was a natural progression for me due to my childhood interest in fine cuisine and diverse cultures, along with my fascination with the science of cooking. I received my diplomas from one of the best culinary schools in Italy (A Tavola con Lo Chef) under the guidance of Michelin Star chefs. Italian cooking has a vast history of excellent traditional recipes and exquisite fine cuisine, and it is my desire to balance these two elements perfectly. Chef in a Day bloopers and cut ! shooting some video-recipes : bloopers aaaaaand cut!! A Korean newspaper and blog wrote 'rave reviews' about my cooking classes. Chef Federico Alessandri invitato in trasmissione a Uno Mattina su Rai1 per parlare del suo progetto Chefinaday! UnoMatina 27febbraio2014 from Federico Alessandri on Vimeo.